​Choosing the best 18 gauge brad nailer for your woodworking project doesn’t have to be a complicated process. With a little effort and some foresight, you can select a nail gun that offers you plenty of function with all the features you are looking for, so you can complete that cabinet construction or molding installation in no time. To help you narrow down your selection, we’ve reviewed four of the top brad nailers on the market today. Don’t make your brad nail gun purchase before you read up on what makes a great 18 gauge brad nailer and which model we recommend. ​This nail gun gets its name specifically from the type of nails it uses, which in turn makes it super easy to remember what you will be loading into it. ​Brad nails are a thinner gauge nail that have a smaller heel. This is a benefit for builders because the small nail heel means that you don’t need to cove the entry hole with wood putty. When it comes to knowing more about nails, you should be familiar with the gauge levels. The gauge refers to the diameter of the nail, it’s thickness. Similar to how you would gauge electrical wires, the larger the gauge number, the thinner the nail is. Thicker nails have a lower number such as 16 to 15 gauge. ​Brad nails commonly come in sizes ranging from 15, 16, 18, and 23 gauge. However, for most, 18 gauge is the perfect size, which is why we focus on the top rated 18 gauge brad nail gun in our reviews. ​Most contractors or DIYers use nail guns with brads for installing trim around the home. This is due to the fact that not only do they leave smaller holes, but they are also narrow enough to keep the trim from cracking or splitting. Brad nailers are also great for around the house small projects that require you to work with smaller or thinner wood. Due to the thinner gauge of the nail, you can use it on more fragile and smaller cuts of wood to hold it together without worrying about cracking the wood like a larger nail would. ​Keeping all these factors in mind, we have selected these five models for our review, all of which utilized 18 gauge nails. Each offers their own benefits and provides plenty of distinct features that will make easy work out of your wood projects. Read on to see how we rated these brad guns and to find out which one we think is the best brad nailer on the market. ​Weighing in at 3.1 lbs, the ​BOSTITCH BTFP12233 Smart Point 18GA Brad Nail Gun is a savvy tool that can be used on a variety of wood surfaces. It has triggered operation and a Dial-A-Depth Control that allows you to countersink nails with precision. It can be used with 18 gauge brads that range from 5/8 to 2-1/8 inches. A smaller nose has been integrated into the model that has been combined with its Smart Point Technology for more accurate brad nail placement. Jams are a breeze to take care of with the jam release mechanism that does not require tools. Operation of the Bostitch BTFP12233 Smart Point uses an oil-free motor for maintenance-free operation. You can also select from sequential or contact operation of the device, allowing you to select the performance preference that works best for you and the job you are working on. You’ll also enjoy the carrying case that this model comes with as well as the additional accessories such as the belt hook, sample fasteners, air fitting, and no-mar tips. It has a 100 brad nail capacity and is sideloaded. This Bostitch has an operating pressure of 70-120 PSI, and does include several no-mar tips to use. You receive a 7 year manufacturers warranty with this purchase, which is far and above any other nailer warranty we've found. 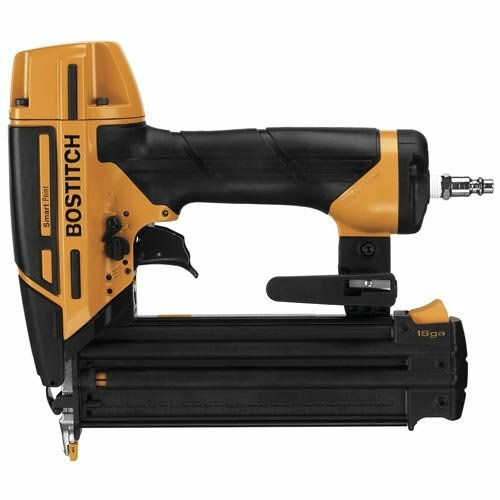 When you're looking for a great 18 gauge brad nail gun, you'll be hard pressed to do better than the Bostitch. This pneumatic brad nailer ranks at the top of our list. ​The ​Hitachi NT50AE2 is a capable tool that you’ll get plenty of use out of. This brad nail gun weighs in at 2.2 lbs, making it a very efficient and convenient device to use. It can be used with 18 gauge brad nails from 5/8 to 2 inches in length. It also has an elastomer grip to prevent slipping during operation. Jammed brads can easily be removed from the nose without the use of any tools, and the Selective Actuation feature allows you to decide if you want bump fire or contact fire operation. This is activated by flipping a switch. Countersinking nails can be achieved by using the dial-in depth option, so you get the exact finish you are looking for with your brad nails. A high capacity magazine has been integrated into the Hitachi NT50AE2. It has a capacity of 100 brad nails, depending on the size of the nail, which is loaded from the bottom of the tool. A nice feature of the model is its visual nail indicator that lets you know when you need to reload. ​It also includes a 360-degree exhaust vent and removable nose cap – both designed to increase the life of the tool. It is constructed of aluminum and comes with a no-mar nose cap to provide additional protection. The operating pressure of the device is 70-120 psi, and a protective case is included. The Hitachi comes with a 5 year warranty as well. 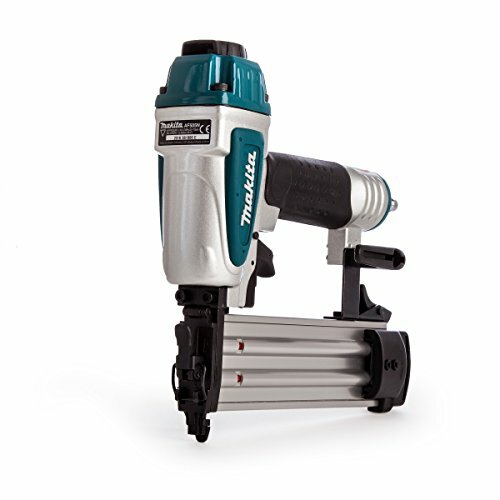 ​The ​Makita AF505N offers plenty of capability that can be used with 18 gauge brad nails with lengths from 5/8 to 2 inches. It features a narrow nose to get into tight areas with ease and clears jams with a tool-less quick release. This model is simple to operate with a dial-in depth adjustment so you can countersink brads as needed. It has a non-marring rubber nose as well as bumpers that prevent damage to your wood surface. The nose piece has been cast and machined for added durability and precision when driving brad nails into wood. A multi-directional exhaust port allows you to point the exhaust away from you and your wood project, so ​it's less likely you need to use a dust mask ​with this one. You’ll appreciate the tool hook this model comes with as it has 180 degrees of rotation. It also features a nail reload indicator window notification, so you know when it’s time to reload a magazine of brad nails. The capacity on the specific nail gun is 100 nails, while the operating pressure is 60 to 115 psi, and weight of the unit is 3 ​lbs. Makita provides a 5 year warranty. 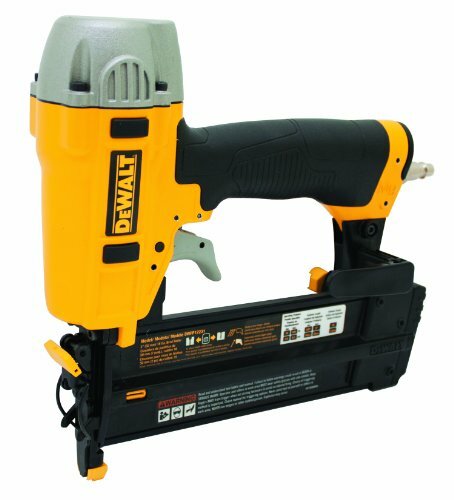 ​Rounding out our ​corded nailers is the ​DEWALT DWFP12231. This Dewalt drives 18 gauge brad nails with a 5/8 to 2-inch length. It has an oil-free motor for easier maintenance of the tool and comes with a tool-free depth of drive adjustment that allows you to countersink nails without having to adjust the device manually. Jams are easily removed with the release mechanism without the need for a tool. The exhaust of the Dewalt DWFP12231 points to the rear, so it is out of your way and away from your wood surface. ​It is constructed of magnesium, keeping its weight to a minimum. Sequential operation of the brad nail is standard along with a 100-brad nail capacity. A non-marring nose tip is included as well as an adjustable belt hook to keep the tool near you as you work. A carrying case is also provided. Dewalt brings a 3 year limited warranty upon sale. This machine ​drives 18 gauge nails with up to 5/8 to two inches length ​​with speeds as fast as 5 ​nails per second. It features ​both sequential operation and bump operating mode with a 110 brad nail magazine capacity, for one-at-a-time nail work and high speed operations respectively. The tool is perfectly suited ​to trim and cabinet workers who ​install base boards, moldings, door and window panels, casings and jambs. It can drive nails with 70-120 PSI through hard and softwood, plywood, among other wood ​varieties. ​The device's notable features ​include its narrow tapered nose ​for getting in to tight spaces, ​and its contact lock-off system, a trigger disabling feature​ for added safety. Jams won't be an issue either as this ​nailer has a swing-open nose piece for easy removal of brads. ​Included in this kit is an 18 volt XRP NiCad battery, a fast charger, a reversible belt hook, safety goggles for operation, and a plastic storage case. A three-year limited warranty is also provided by Dewalt upon purchase, along with a two-year limited ​service contract ​for the battery. ​Depending on the model of brad nailer you select, you’ll have a range of options to choose from that can make your wood projects a little easier to bear. We’ve listed the most important features you need to consider when investing in the best brad nail gun for your workshop, that will go best with your saws. This will prevent you from purchasing a nail gun that does not offer all the capabilities you are looking for. These key factors are great to know before you purchase a brad nail gun, so that you know what is compatible with what you need to use the tool for as well as what each feature really means. You need to have some idea of the preferred brad nail size that you intend to use most often. Most nailers offer a range of brad lengths so that you can use the tool for more than one application. The big decision comes down to whether your want your nailer to cap out at 2" long brads or 2 1/8" long brads. While the difference in length seems very minimal, it can affect what you are able to do with the tool. Some brad nail guns cap out at 2", while others cap at the longer 2 1/8". In the end, if possible, opt for a nail gun that can handle the longer length. Some brad nails that say they are 2" actually end up being a little longer, so this ensures that your nail gun can handle these. ​Narrow nose options allow you to get into tight corners without struggling. A narrow nose design also allows for more precise nailing, giving you a more pristine look as you work. To give you the best perspective, when you are using brad nails, you are firing pretty tiny nails. If the nose of the nail gun that you are using is large in diameter, then you could end up being more off than precise. Choosing a smaller nose with your brad nail gun will allow you to better pinpoint where your nail is driven into. It can be a lot more accurate for projects that you need to place the nail in an already marked spot. Weight is also an important feature in your nailer. Because you will be holding this tool for an extended period of time, you want a device that feels comfortable in your hand and is lightweight. Many brad nail guns are constructed of aluminum, which reduces the overall weight and helps with exhaustion and fatigue as you work. The type of brad nailer that you purchase will also factor in with the overall weight as you will see next as we discuss pneumonic and cordless options. When you are shopping for the best brad nailer, there are two main power options that you can choose from: the corded pneumatic version and a cordless battery operated one. ​A mouthful of a word, pneumatic basically means that the nailer derives its power from an air compressor. The compressed air is what provides the power that drives the brad into the material. This type of nail gun is also lightweight compared to the battery powered versions. If you will be holding this nail gun for long periods of time then you will want to find something that has a good grip and won’t wear down your wrists and arms with long periods of use. Pneumatic nailers are a lot more powerful than cordless nailers, which seems pretty obvious. Believe it or not, pneumatic brad guns are also significantly cheaper, especially if you already have an air compressor. If you don't have an air compressor, then that levels the playing field a bit. Purchasing an air compressor can cost a bit more out of pocket, so that is something to keep in mind as you are searching for the best brad nailer. ​​On the other hand, cordless nail guns are relatively self explanatory. These nailers are a great option for contractors and DIY specialists who need to be able to move around freely while they are working. 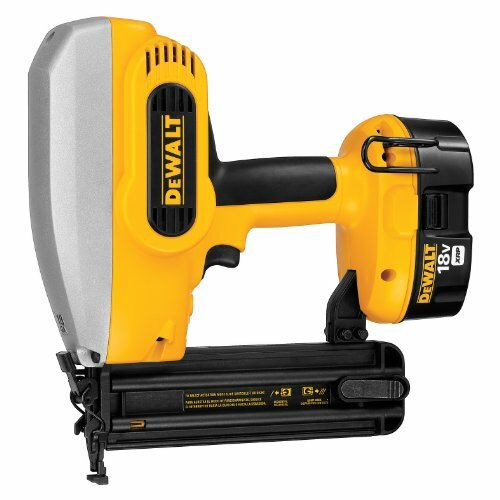 Cordless brad nail guns will come with a rechargeable battery, so that you don’t need to go out and make any additional purchases in order to begin using it. However, if you know that you will be using your nailer for longer periods of time, then having an extra battery or two gives you non-stop working abilities. Simply keep one charging while you use the other, then switch once the one you are using dies. Also, not having a cord gives you more freedom to move around with your nail gun. You don’t have to stay in a confined location or have to bring an air compressor with you if you move to a different area or level. While the pneumatic brad nailer boasts a more powerful drive, you will still be able to successfully drive brad nails into your projects without trouble. The biggest drawback cordless brad nailers face is that they are heavier due to the additional batteries weight. When it comes to choosing between these two great options, you need to figure out what you will be using your nail gun for and how much you need to be able to move around the workspace with it. Also if you already own an air compressor then that can make the decision much easier. Manufacturers also make electric nail guns specifically designed for brad nails. However, we don't really recommend electric nail guns... they are more expensive than pneumatic, but lack the convenience of a cord free option. When you are selecting one of these nail guns to add to your toolkit, looking for a model that has some safety features that can help prevent an accident from occurring. ​Jams will happen, this key feature allows you to remove a jammed nail without needing extra tools to get it open and back to use. This jam release system also works by keeping you safe while you are releasing a jammed nail. Always take precaution while you are working on a nail gun by using OSHA safety precautions. Never face a nail gun towards you or anyone else in the event of a misfire. Also turn nail guns off or unplug them from any power sources if you have to work out a jam or other problem. ​Built in LED lights are super handy to have, even if you don’t think you will use them all the time. This bright features can help give you a better view when you are working in tight spaces, hard to see corners and in dim settings where there is little to no lighting. Even if you can see pretty well, the shining LED lights can give you a clearer view of where you are driving the brad nail, which can be helpful for beginner or still advancing power tool users. 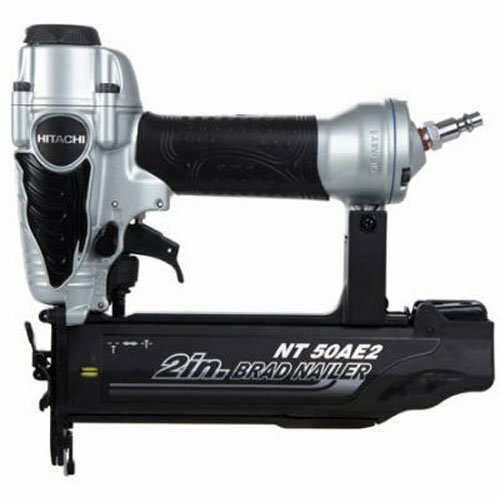 ​We consider this feature a must have when you are searching for the best 18 gauge brad nailer. While you are working, you may not take notice of how many nails you have left inside of the nail gun. When you fire the gun without a nail in the chamber, this can cause damage to occur to the insides of your nail gun, especially if you are using a higher powered option. The dry lockout feature won’t allow you to fire the nail gun when there is no nail in the chamber, reducing the chances of breaking or internally damaging your nail gun. Having this feature also lets you know when you are out of nails, so that you aren’t continuing down a line of driving nails, without realizing that you have been out for some time. ​Because you also may need to countersink brads as you work, having a nail gun that allows for dial-in depth makes the process easier and safer for your kids to ​work on ​your projects with you. The dial is also really easy to locate and turn so that you can adjust as needed without having to struggle to find the knob. The only drawback is that sometimes this knob when located on the nose, it can get a dust buildup that makes it difficult to turn. To counteract this issue, just wipe your nail guns nose after each use to prevent dust from settling in and around the knob. ​Always choose a brad nailer that comes with a warranty. Many manufacturers offer multiple year warranties that provide you coverage. This will give you plenty of protection should you have an issue with it over time. ​Having an oil free motor means that you won’t have to deal with the added mess of adding oil to your nail gun. If you already work with putting oil in your other power tools and workshop items, then this may not be a big deal. However, for the occasional DIYer having an oil free motor may be more preferable since this isn’t something you are going to use on a daily basis. Remembering to check/add oil can be something that slips your mind if you only pick up the nail gun once a month or so. ​The above features are the ​various things you should consider as you read through brad nailer reviews. However, we think these not as monumental add ons are just the icing on the cake when it comes to finding your next nail gun. ​Even if you aren’t traveling with your nail gun, a case is a great thing to have. It allows you to have a specific storage place for your brad nail gun as well as offering it protection from the elements and everyday dust gathering. For contractors, a case protects your nail gun while it is not in use. Making sure that it it not damaged as you are travelling or while you are on the job. While you don’t need a case for your nail gun, it is a great perk to consider. ​Either a fuller rubber or just a rubber tip on the nose is a great precaution. This gives your wood extra protection from any minor scratches or scrapping that can happen when you are using a nail gun. While the minor scratches are a normal part of any building project they can easily be covered by paint, sealing and other finishes. Having a rubber nose tip may not be the deciding factor on your choice of a brad nailer however, we think it’s a great added benefit on any one that you choose. ​Most nailers on the market should come with a belt hook so that you can place it on your side while you still need it, but need your hands free for a few minutes. This can be very handy when it comes to climbing ladders, having to pause to work on another project or if you need to relocate with other items. At the end of the day, make sure that you’ve considered the applications you’re going to need the nail gun for, and that this nail gun is best for you (not its close sibling the pin nailer). ​When it comes to selecting the best brad nailer for you, we recommend the ​​BOSTITCH BTFP12233 Smart Point 18GA Brad Nailer. This versatile tool allows for plenty of performance while also offering all the features that we think are important in a brad nail gun. You’ll do well adding this model to your toolbox and get plenty of use out of having it on hand. We give it high marks and recommend it for your woodworking projects.